Announcing a new release of VantagePoint! Introduction to VantagePoint - Take a look at this presentation for a quick overview. 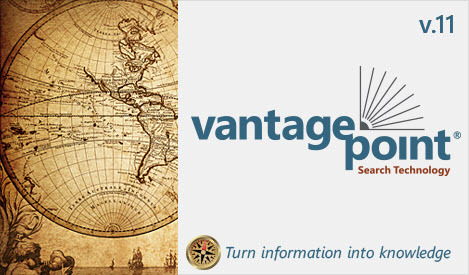 VantagePoint plays a role in reports from the UK Intellectual Patent Office. Contact us to ask about a 30-day trial of VantagePoint. VantagePoint comes with access to our library of import filters, thesarui, and macros. These provide the resources you need to import, transform, analyze, and visualize data from a large number of on-line providers. - Browse the Library - VantagePoint comes with tools to build your own import filters, thesauri, and macros for your proprietary data sources and business processes. You can also import Excel® or Access® data using VantagePoint's "Import Database Table" wizard.